Nicholas Hooper really has been given one of the best, and worst, jobs in the world in taking over the musical voice of the Harry Potter franchise. On the one hand, this is the gig of a lifetime: working on a globally successful, massively popular series of films which are guaranteed to be enormous box office hits and bring his name and voice to millions. On the other hand, he’s taken over from arguably the most popular living film composer – John Williams – and as such faces the ire of countless film music fans who don’t like his music because his first name isn’t John and his second name isn’t Williams. As much as Hooper’s first score for Harry Potter and the Order of the Phoenix in 2007 was disappointing, I think I was still a little guilty of having that frame of mind going in: he doesn’t sound like John Williams, so it can’t be good. It can’t possibly add anything to the Potterverse. I was one of the few who managed to take Patrick Doyle’s Goblet of Fire score at face value, and so coming in to Harry Potter and the Half-Blood Prince I was determined not to pre-judge it this time round. And you know what? Having adopted that frame of mind, I really enjoyed it. 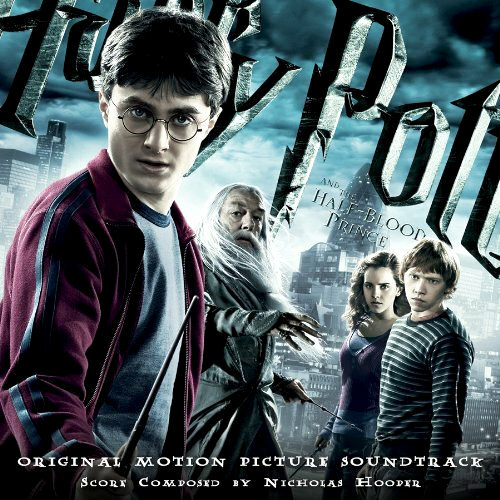 Harry Potter and the Half-Blood Prince, for anyone who has been living under a rock for the past decade, is the sixth film based on the indescribably successful series of books by author J.K. Rowling, and follows the adventures of young wizard Harry Potter at the Hogwarts School of Witchcraft and Wizardry. With the evil wizard Voldemort increasing the frequency of his deadly attacks on with magical and non- magical world alike, Hogwarts headmaster Albus Dumbledore recruits Harry to help him find several magical items called Horcruxes, which Dumbledore believes may be the key to defeating Voldemort. In addition to all this, Harry must also cope with his school work, his ownership of a mysterious textbook which once belonged to someone called “the half blood prince” which seems to have dark powers, and his increasing romantic feelings for Ginny Weasley, the younger sister of his best friend Ron. The film, which is directed by David Yates, again stars Daniel Radcliffe, Rupert Grint and Emma Watson, and features a stellar English supporting cast that includes Michael Gambon, Alan Rickman, Ralph Fiennes and newcomer Jim Broadbent. From the outset, it is clearer that Harry Potter and the Half-Blood Prince is a much, much darker score than its predecessor. It’s also a distinct improvement on Order of the Phoenix, and is likely to go some way towards satisfying those who felt that Hooper’s first score was a step in the wrong direction for the franchise. Where Order of the Phoenix was at times too light and fanciful, Half-Blood Prince has a more mature, more emotionally satisfying feeling running throughout: of course, the film is primarily about love, and loss, and death, so it stands to reason that Hooper’s score would explore these emotions in greater detail. It’s immensely gratifying to note that, having seemed a little overly-restrained during his first go-round, Hooper seems more comfortable in his composing skin here, and is less hesitant to play on the listener’s emotions – although, even here, at times Hooper restrains himself just a little too much for my liking. Depending on your point of view, the fact that Williams’ themes for the series are largely absent may cloud your view of the score. The famous Hedwig’s Theme – the musical marker for the entire franchise – appears only in the “Opening” and in “Ginny”, and even then in a slightly deconstructed version, while Williams’ furious Quidditch music appears briefly in “Ron’s Victory” and “Of Love & War”. However, as much as this may frustrate some people, I am actually coming to the conclusion that the gradual departure away from the Williams sound is actually beneficial to the story as a whole. At the beginning, Harry’s world is one of wonderment and awe and fantastical creatures – and, as such, Williams’ music reflected that sense of youthful magic with strong themes that were flighty, memorable, and fun. However, as the series has progressed, so has its tone darkened and matured: in the end, Harry Potter’s story is less about a little boy who can do magic and more about a tortured, troubled young man who must overcome incredible odds, face the loss of everyone he loves, and literally battle for the fate of the world alone. Loyalties and allegiances are ambiguous, motivations are unclear, and things are not as they seem; as such, the increasing ambiguity and emotional reticence of first Doyle and now Hooper’s music seems to mirror the shift in tone – as Harry’s world grows more complex, so the emotions in its musical accompaniment are less obvious, more hidden. Hooper’s main new construction is “In Noctem”, a truly lovely, if a little mournful piece for a choir singing in Latin, which acts almost as a leitmotif for Dumbledore and his sacrificial journey through the film. The piece – which means ‘of the night’ in English – appears in several cues thereafter, notably in the threatening-sounding “Dumbledore’s Speech” and “Dumbledore’s Foreboding”, under the tumult during the exciting and dramatic “Journey to the Cave”, and as a gorgeous, heart-wrenching cello solo in “Dumbledore’s Farewell”. In musical terms, it almost plays as a combination of Williams’ “Double Trouble” motif from The Prisoner of Azkaban, and the stunning “Harry in Winter” theme from Doyle’s Goblet of Fire, which makes for a very enjoyable listen. Furthermore, the final words of the song (sung in English) – “never will forget” – are very poignant when you understand their context. The romantic element of the story – and notably the love pentagon between Harry, Ron, Hermione, Ginny and newcomer Lavender Brown – is scored with grace and charm a lovely trio of cues comprising “Ginny”, “Harry and Hermione” and “When Ginny Kissed Harry”. “Ginny” features a splendid duet for oboe and harp, and “Harry and Hermione” expands on the harp element to lovely effect, while the pivotal teenage love scene “When Ginny Kissed Harry” has an appropriately contemporary acoustic guitar element under the orchestra. Lush, flighty Englishness abounds in cues such as “The Story Begins”, which features dancing woodwinds and effervescent string writing that sounds like something George Fenton or Rachel Portman might have created. Dolores Umbridge’s obnoxiously prissy theme from Order of the Phoenix makes a guest appearance in “Living Death”, and there’s even a hint of Scottishness in “Farewell Aragog”, while the Weasley twins retain the anarchic musical character they were given last time out in “Wizard Wheezes” and “The Weasley Stomp”, a pair of lively, jazz and Irish-infused pieces which stand at odds with the rest of the score but are still great fun. The action music, in cues such as the “Opening” and “Into the Rushes”, tends to be dark and brooding, with heavy percussion, high-pitched sustains, frantic string runs, and deep bass choral notes, accompanying Voldemort’s evil Death Eaters as they wreak havoc on the world. Other cues, notably “Into the Pensieve”, veer towards the dissonant, even going so far as to incorporate eerie processed vocal effects into the mix, chattering away in your ears as the violent past of Voldemort is revealed. Elsewhere, “Malfoy’s Mission” hints at the torture being endured by the young Slytherin wizard with a dark, introspective piano theme that is unexpectedly poignant, and adds a sense of depth and tragedy to his character. Unfortunately the climactic quartet, from “Journey to the Cave” through to “The Killing of Dumbledore”, is not quite as powerful and moving as one might have expected it to be. The eerie whispers in “The Drink of Despair” are effective, and the unexpectedly beautiful finale of “Inferi in the Firestorm” has a tragic-sounding choral element which juxtaposes Harry and Dumbledore’s imminent mortal danger with a sense of relief, but the whole of “The Killing of Dumbledore” – arguably the most important and emotionally shattering moment of the entire franchise – is scored with an underwhelming set of standard string sustains which give no hint as to the gravity of the scene it is accompanying. By and large, though, this is a tremendous improvement over Order of the Phoenix, and gives me a little more hope that Hooper will be able to cope with the scale of music required for the franchise’s finale, The Deathly Hallows, in 2010 (assuming Williams doesn’t return, as has been rumored). People who still pine for Williams’ sound for the franchise are still likely to find plenty to criticize in Hooper’s work, but the more I listen to this score the more I am beginning to understand what Hooper is tying to achieve with his music, and the more I respect his decision making and his refusal to compromise. Would I prefer Williams or Doyle to have continued on with the series? Yes, probably, if Williams could move away from whimsy and into the darker territory these latter films have explored. I would even have preferred James Hannigan to have been given a shout, considering the magnificent work he did on the last two video games based on the films. But, still, and almost against my will, Hooper is growing on me, and this can only be a good thing. Music composed by Nicholas Hooper. Performed by The Chamber Orchestra of London. Conducted by Alastair King and Nicholas Hooper. Orchestrations by Jeff Atmajian, Alastair King, Geoff Alexander, Simon Whiteside and Daryl Griffith. Original Harry Potter themes by John Williams. Recorded and mixed by Peter Cobbin. Edited by Robert Houston. Album produced by Nicholas Hooper. I love you Harry Potter . Always…..